DECIDING WHETHER TO HIRE A LOCAL APP DEVELOPMENT COMPANY IN DALLAS, TEXAS? With nearly 19 Fortune 500 companies, Dallas is becoming a hub for business and technology. If you’re looking for an experienced, local app developer to push your business forward, we created a shortlist of the top-performing development shops near you. 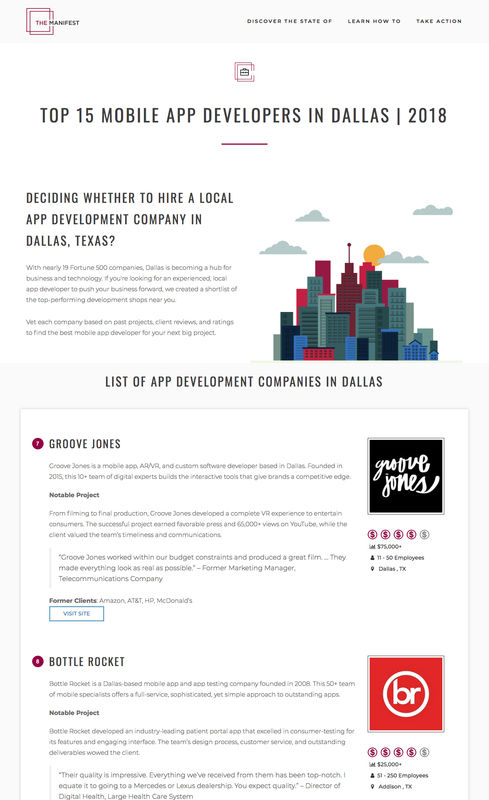 Groove Jones is a mobile app, AR/VR, and custom software developer based in Dallas. Founded in 2015, this 10+ team of digital experts builds the interactive tools that give brands a competitive edge. From filming to final production, Groove Jones developed a complete VR experience to entertain consumers. The successful project earned favorable press and 65,000+ views on YouTube, while the client valued the team’s timeliness and communications.